Get in the mood for this date by wearing flannel shirts and horseback riding boots. 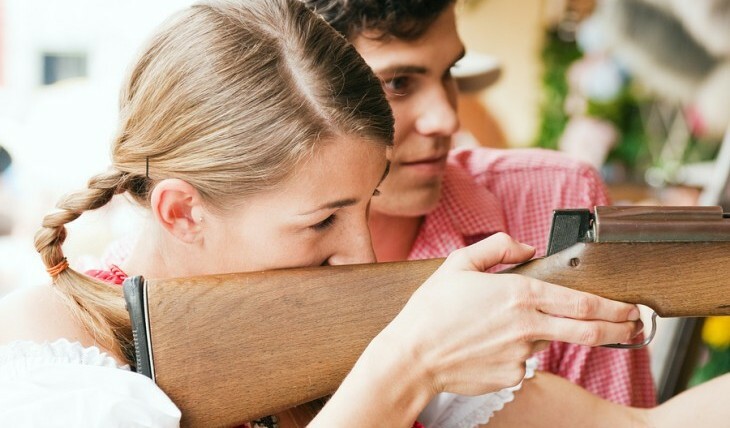 If you’re a skilled shooter, impress your babe with your marksmanship. And if you’re a little gun shy (pun intended), a good tip to remember is to move with the recoil as the gun hits your shoulder to avoid bruising or discomfort. Always wear safety goggles and practice safe shooting. Don’t point your rifle anywhere but the target and follow all the instructions provided by the event coordinators to ensure a fun and safe time. When your turkey shoot is over, it’s time to head back for a romantic home-cooked meal. Cooking is a fun activity that you can enjoy together. Grow closer with your sweetheart while swapping recipes or researching some new ones. For something simple, make a dish like pasta with red sauce and turkey meatballs. During your date night time in the kitchen, discover each other’s favorite foods and types of cuisine. If you don’t feel like cooking, order in! Opt for cheesy pizza or spicy Thai food, whatever the two of you are craving after your big day. Look into some famous restaurants near you and see if they offer take-out as well. After dinner, make Thanksgiving-themed drinks like hot apple cider or cranberry and vodka and watch a Thanksgiving movie. You and your honey will laugh until it hurts watching a classic like Trains, Planes and Automobiles. Then, get a little sentimental and relive your childhood with A Charlie Brown Thanksgiving. Build a fire in the fireplace and really get cozy with the one you love as you prep for the upcoming holiday. This date idea could be you and your sweetheart’s new November tradition! Ever been on a Turkey Shoot? Tell about your experience in the comments below!